Italian Meringue Buttercream Frosting is made from sugar, egg whites, and butter. Unlike American buttercream, it’s light, fluffy, and never cloying. This step-by-step tutorial includes options for vanilla, chocolate or strawberry buttercream, as well as suggestions for additional flavors. It may appear a bit daunting at first if you’ve only prepared American buttercreams, which are made from butter and confectioners’ sugar. However, if you can push yourself through those nerves and give this a try, you will never go back. 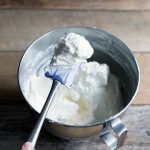 Once you know this basic buttercream frosting recipe, the possible flavor combinations are endless! I’ve shared many recipes over the years that highlight meringue buttercream frosting, such as my chocolate espresso layer cake and peach bourbon cupcakes. However, since the process can be a bit involved, I figured it was time to create a step-by-step tutorial demonstrating exactly how you make it. American buttercreams consist solely of butter and sugar, so they’re often rich, heavy, and overly sweet. 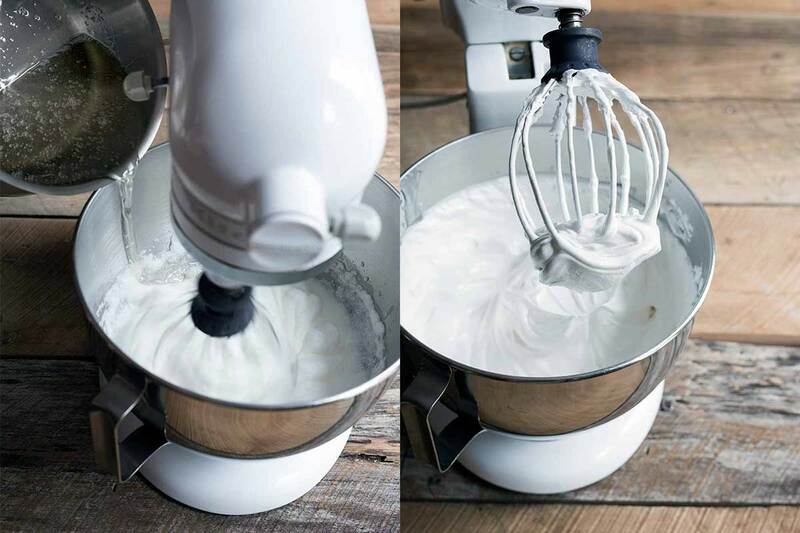 Since meringue buttercreams also contain egg whites, the result is much lighter and less cloying. When cooking sugar syrups, the soft-ball stage occurs between a temperature range of 235 and 245 degrees F. This temperature will make sure the egg whites are safe to consume, and also help create the right meringue consistency. How do you prevent sugar from crystallizing? Start with a very clean saucepan. Add 1 teaspoon of corn syrup to the sugar and water. This step is optional, but it does help. Don’t stir the ingredients after adding them to the pot. The syrup will form on it’s own once the sugar dissolves. Cover the saucepan until steam develops. 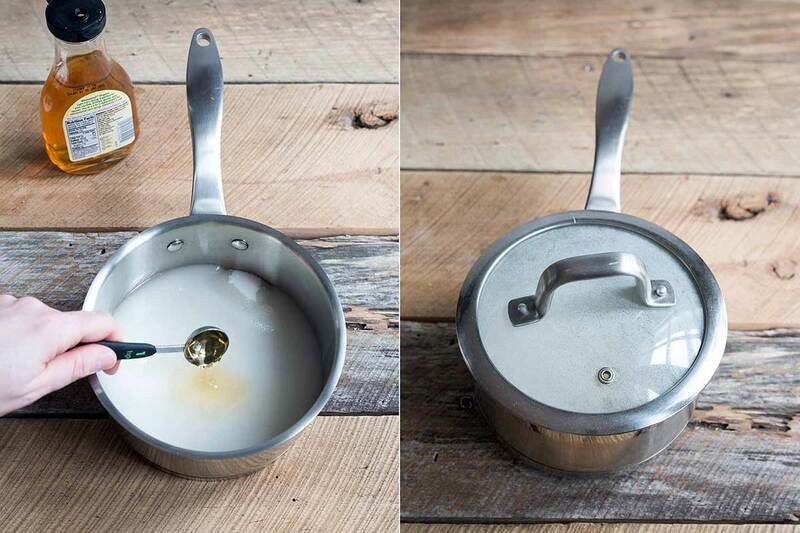 Once steam develops, remove the cover and add the thermometer to the pot. 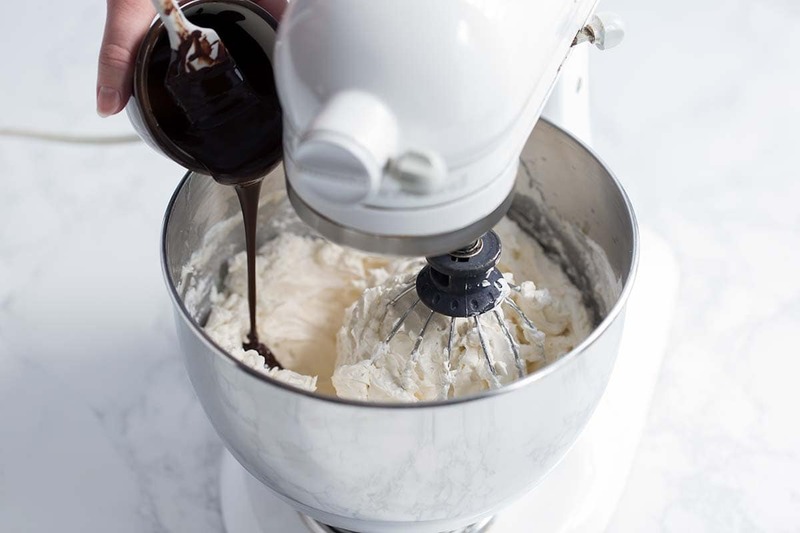 While the syrup is reaching the soft-ball stage (which takes around 5 minutes), place the egg whites in a stand mixer fitted with the whisk attachment and turn the speed to high. Whip to a soft peak. Once the syrup is ready, turn the mixer to medium-low. Slowly and carefully pour the syrup down the side of the mixer into the egg whites. You might want to wear oven mitts the first time you do this to protect your hands (I’m a fan of the Ove Glove mitts since they give me a lot of control). Don’t add the syrup too quickly or you could wind up with scrambled eggs. This is also why the syrup is poured down the side of the bowl instead of straight into the eggs. Once the syrup is completely incorporated, turn the speed up to high and let the meringue form a stiff peak while cooling to room temperature. This can take 15-20 minutes, so it’s a good time to do the dishes. Placing ice packs around the bowl can help speed up the process. Once the meringue is at room temperature, it’s time to add butter, followed by any additional flavors. The meringue will start to thin out slightly when you begin adding butter, but it will thicken up again by the end. This step is where the buttercream has the potential to break, which will happen if the butter and meringue are different temperatures. Buttercream breaks when the ingredients separate. Don’t worry, because it’s very easy to fix broken buttercream. But first, there are some steps you can take to prevent this from happening. 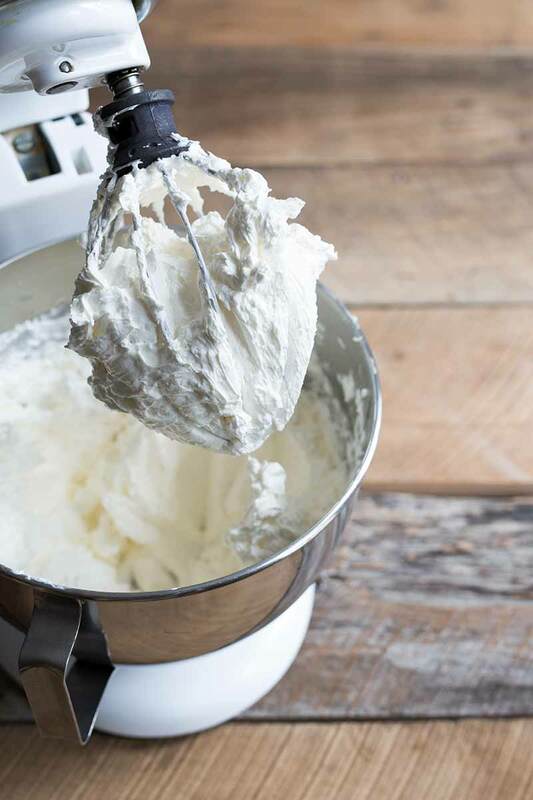 To avoid broken buttercream (which looks curdled like cottage cheese), leave the butter out overnight so it can truly come to room temperature. Also, wait until the meringue has cooled completely to room temperature before you begin adding the butter. We don’t always have the foresight to leave butter out overnight. If you only have a few hours, cut the butter into very small pieces so it can reach room temperature more quickly. If the buttercream happens to break, don’t panic! Simply fit it. The easiest way to fix broken buttercream is to scoop 2-3 tablespoons into a small ramekin and microwave it on HIGH power for 5-10 seconds, until it’s just melted. Next, turn the mixer on high speed and pour the melted buttercream back into the bowl to incorporate. If that doesn’t fix it, repeat the process as needed. 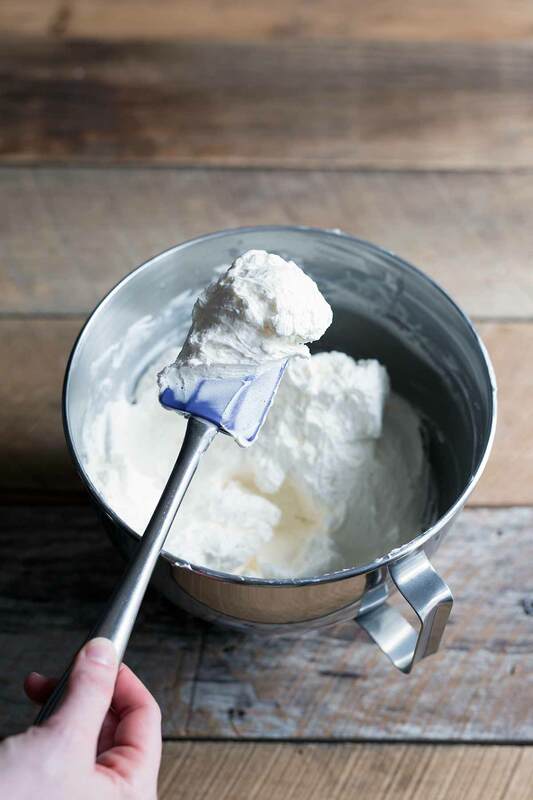 For more buttercream frosting tips, make sure to read my Buttercream Basics article! Check out my yellow sheet cake with chocolate sour cream frosting and my Nutella cheesecake bars! Italian Meringue Buttercream refers to a type of frosting made from sugar, egg whites, and butter. It’s light, fluffy, and never cloying. This recipe includes options for vanilla, chocolate or strawberry buttercream, as well as suggestions for additional flavors. Place the sugar, water and corn syrup in a medium-sized saucepan (do not stir). Cover and turn the heat to high. Once the liquid begins to simmer and steam develops, remove the cover (this helps prevent crystallization). Using a digital or candy thermometer, cook the sugar to the soft boil stage, 235-245 degrees F.
While the sugar is cooking, whisk the eggs on high in a stand mixer fitted with the whisk attachment, until a soft peak has formed. Turn the mixer speed down to medium-low and very slowly pour the syrup down the side of the bowl into the egg whites (this will “cook” the egg whites, making them safe to consume. Don’t pour the hot syrup directly into the meringue or you’ll have scrambled egg whites. Once the syrup is completely incorporated, turn the speed to high. The meringue will continue to form a stiff peak as it cools down. Mix on high until the meringue comes to room temperature, approximately 15-20 minutes. Once at room temperature, slowly begin incorporating the soft butter on medium speed. 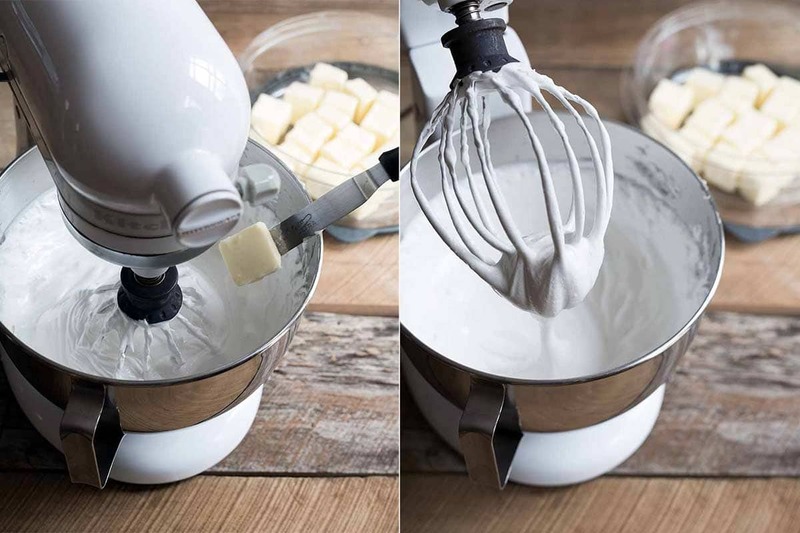 Once all of the butter has been added, turn the mixer speed up to medium-high and slowly add the vanilla and any additional flavors (see variations). If not using immediately, store the buttercream in an airtight container in the refrigerator, then bring to room temperature before using. 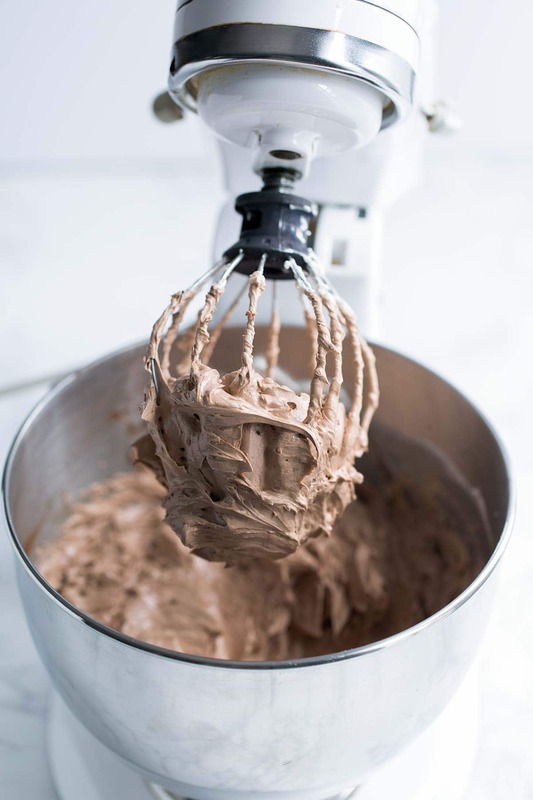 Briefly whisk or place back in the stand mixer with the whisk attachment to make sure it’s nice and fluffy before frosting. Buttercream can also be frozen for up to 3 months (I like using gallon sized freezer bags). This recipe yields enough buttercream to frost one 8 or 9-inch triple layer cake. Corn syrup is optional in meringue buttercream. It helps prevent the sugar syrup from crystallizing. I typically melt small quantities of chocolate in the microwave. Coarsely chop the chocolate and place in a small microwave-safe bowl. Microwave in 20 second increments, stirring each time, until the chocolate is smooth and shiny. Cool to room temperature, stirring periodically. I recommend using gel food coloring, which has a much more vibrant color with only 1-2 drops. It's available online and in specialty shops. Meringue buttercream can take a decent amount of additional liquid for flavoring, up to 1/4 cup. The key is to add slowly and make sure the ingredients are at room temperature to avoid breaking the buttercream. Other fruit purees or nectars! Don't use anything sweetened. Has anyone tried this with a butter substitute like earths first baking margarine? I’m making a cake for next weekend and we have multiple kids with dairy allergies. Thank you! I just tried this recipe with the Earth Balance substitute and the taste was awful. The soy in the butter came through way too much and overpowered everything! Did you end up trying it with your substitute? That’s super helpful, Tamar! Thanks for passing along the info! I get a lot of questions about this. Can you use this to frost cut out sugar cookies? I want a really nice fluffy frosting, something better than an overly sweet frosting that feels greasy in your mouth. I don’t see why this wouldn’t be great on sugar cookies! Could you let me know how much this makes? I am assuming it would be enough for a double layer cake but do you think it could cover a 4 layer cake? Each layer about 1.5 inches or 2 inches thick using a 9″ diameter cake pans (plus fillings of course). Thanks! Hi Robin, great question! I’ll add this to the recipe notes. I use this size batch to frost my triple layer cakes all the time. I think you could definitely stretch it to 4 layers if you went a bit light and didn’t plan on adding frosting embellishments (I usually keep my frosting look very simple). This chocolate espresso layer cake uses the same quantity of frosting, and I believe I usually have a bit of leftover buttercream. You can see in the photos how thick my frosting layers are. You could also up the recipe by half to be safe. We’ve tried this a couple of times now, and both times, the lovely soft peaks of the egg whites liquefied when we added the syrup. The mixture stayed liquid until we added the room-temperature butter and beat it all for a long time. Is this a temperature problem? We were using pasteurized egg whites from a carton, pretty close to room temperature when we first beat them. The first batch broke down again when we added gel color. Could it be fixed the same way? Sorry you’re running into issues! I don’t think pasteurized eggs would be an issue. People usually don’t run into potential issues until adding the butter. The most likely culprit with a soupy meringue is that the egg whites need more stability before adding the sugar syrup. Whipping the eggs on a slower speed for longer, and then slowly increasing the speed can help with this since the tiny bubbles of air are smaller. Try giving the egg whites more of head start (maybe 3-5 minutes?) before starting the sugar. You could also try adding 1/8 teaspoon of cream of tartar per egg white. I’ve never tried this, but I think it should work. When you say the first batch broke down when adding gel color, do you mean it got too thin or it curdled? If it curdles, try my troubleshooting tip with the microwave. Great tip about the salted butter! I don’t keep that around since I buy unsalted in bulk, but I’ll try adding a bit of salt next time. I bet it adds a nice flavor balance. (Edit: holy typos, Batman. I guess I need more coffee). The first batch curdled when the color was added. I wasn’t watching when it happened–this is my 12-year-old’s project. But I did see it later. Most of the color drained out in the “whey,” and there were barely enough curds for a crumb coat. Hence the second batch, which he didn’t color. He’s trying again today, and we’ll use your tips. Thanks! I am an amateur baker who is able to do good work. I have been asked to make a wedding cake this summer and I was wondering if this frosting holds up well in the heat. The wedding is outdoors, in July, in Missouri. It could easily be upwards of 90 degrees outside, possibly 100. I have never made this, but I have been looking and I am ready to try! Hi Ann! I’ve never let this cake sit out in those sort of temperatures, so I’m not entirely sure. I worry about the butter getting too soft, but in theory that could happen with ANY frosting in those conditions. I’d do 2 things if I was you. First, I’d try contacting a local bakery or caterer to see if they can offer you some guidance. I’m sure both of those types of businesses have had to deal with desserts in high heat. The answer might be that they use firmer buttercreams in high heat or add stabilizers. The other thing I’d consider is doing a test run. Anytime I’m cooking or baking for an important event and I want to make sure something works, I make it in advance. I realize you might not get those types of temperatures until June, but it might be worth it to try then. Let me know what happens if you do wind up using my frosting! I’d love feedback on how it performs in high heat weather. Hi, thanks for commenting! I’m sorry you ran into this issue; it definitely sounds like something might have gone wrong. If anything, I sometimes worry that this buttercream is too sweet if there isn’t a bitter element like unsweetened chocolate added. Let’s see if we can figure out what happened. I’ll start with a couple basics- You mentioned using unsalted butter. Did you also use granulated white sugar and large egg whites? Were there any tweaks to the ingredients, ingredient quantities or directions? I always have to ask because sometimes people do make changes that they don’t think will make a difference. If not, my second thought is that something was accidentally measured wrong (either too little meringue or too much butter). I’ve done this many times, no matter how careful I think I’m being! My cake batter wasn’t coming together the other day and I realized I had accidentally used half the butter required. Thank you for your response. Yes I used regular sugar (not the kind that is refined) and large eggs, do you think that I might need to add one more egg in case there are not large enough?….I will try the recipe again, I really want it to work because I don’t like very sweet toppings on my cakes and regular buttercream is too sweet . I’ll let you know how it goes. Best regards.